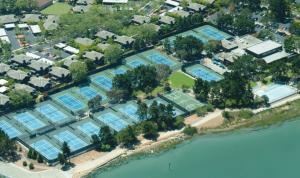 The Harbor Bay Club is located at the water's edge on the northwest side of Bay Farm Island in Alameda. Our facility offers a quiet, park-like setting that is shaded by a canopy of mature trees. The Clubhouse affords spectacular, panoramic views of San Francisco, The Bay and the surrounding area. The building features arched windows, a two-story atrium with skylight, wraparound redwood decks, and fireplaces on each floor. The first floor’s main reception room features a wall of windows facing the water. The foyer is comprised of two-story, sky-lit atrium, a banquette room overlooking the water, and a large central fireplace. For those seeking an outdoor experience, we also offer a large barbecue facility with picnic tables and a lawn area. The second story mezzanine encircles the atrium. you can lounge in front of a cozy fire, take in sunsets an city views from the deck, or enjoy sporting events on one of nine television sets while having a snack or meal in our Bar and Grill. Besides we have swimming pool, fitness center, spa, tennis court and all that you need. Clubhouse Capacity: 150 for seated meals, 200-250 stand-up receptions Corporate events: 10-80 guests Barbecue Capacity: 100 guests Availability: Weekends only, Year round, subject to availability. Services and amenities includes: • Tables & chairs for up to 60 guests • Women’s and Men’s Restrooms • Wheelchair Access and Large Elevator • Outdoor Barbecue Facility • Alcoholic Beverage Service • Free Parking Please see our attachment for pricing details and rental rates or contact us for more information. Deposit is a minimum 50% of all building and staffing fees. We also require a $500 refundable damage/cleaning deposit. All rental prices subject to sales tax and 18% service fee (set-up of HBC equipment, event maintenance labor costs, HBC equipment break down). The Club offers indoor facilities like dining room, banquet room, mezzanine and outdoor facilities like barbeque area and lawn. Please visit the following link to view all our facilities.